These four strategies summarizing, question generating, clarifying, and predicting are all researched based strategies that help student comprehend their text (Miller and Veatch, 2011). This strategy is proven to help student with comprehension skills, mainly because it incorporates four different strategies to help reader understand the text. This strategy doesn't only include four strategies, but it has one of the most effective aspect for struggling learning, cooperation. "The national reading panel further identifies cooperative learning as an effective practice in helping student learn reading strategies to improve their comprehension" (Jennings, Caldwell, and Lerner, 2014). Vygotsky and Piaget both believe that students learning through the collaboration with others. They believe that students can learn best through the collaboration, play, and experiences with others (Gunning, 2010). This strategy has been known and researched to dramatically increase students comprehension reading level. 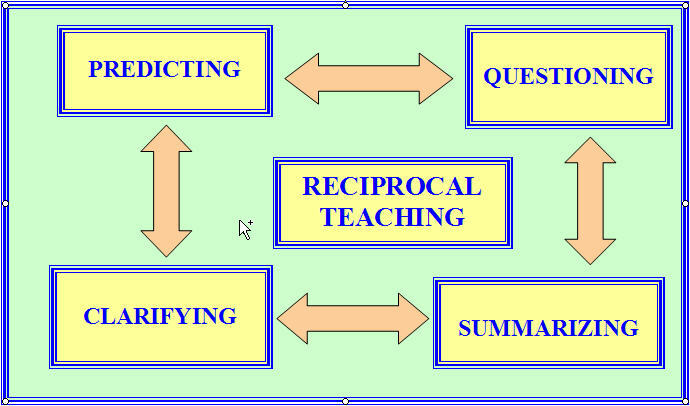 "Reciprocal teaching is a highly effective way to teach comprehension strategies"